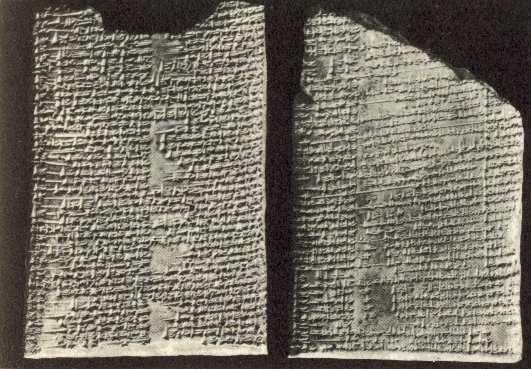 The Enuma Elish has about a thousand lines and is recorded in Old Babylonian on seven clay tablets, each holding between 115 and 170 lines of text. The majority of Tablet V has never been recovered, but aside from this lacuna the text is almost complete. A duplicate copy of Tablet V has been found in Sultantepe, ancient Huzirina, located near the modern town of Sanl鮱rfa in Turkey. The epic names two primeval gods: Apsu, the fresh water, and Tiamat, the salt water. Several other gods are created (Ea and his brothers) who reside in Tiamat's vast body. They make so much noise that it annoys Tiamat and Apsu greatly. Apsu wishes to kill the young gods, but Tiamat disagrees. The vizier, Mummu, agrees with Apsu's plan to destroy them. Tiamat, in order to stop this from occurring, warns Ea (Nudimmud), the most powerful of the gods. Ea, uses magic to put Apsu into a coma, then kills him, and shuts Mummu out. Ea then becomes the chief god, and along with his consort Damkina, has a son, Marduk, greater still than himself. Marduk is given wind to play with and he uses it to make dust storms and tornadoes. This disrupts Tiamat's great body and causes the gods still residing inside her to be unable to sleep. They persuade Tiamat to take revenge for the death of her husband. Her power grows, and some of the gods join her. She creates 11 monsters to help her win the battle and elevates Kingu, her new husband, to "supreme dominion." A lengthy description of the other gods' inability to deal with the threat follows. Ultimately, Marduk is selected as their champion against Tiamat, and becomes very powerful. He defeats and kills Tiamat, and forms the world from her corpse. The subsequent hundred lines or so constitute the lost section of Tablet V.
The dependence of at least part of the creation accounts found in Genesis on a common ancient Near Eastern "creation-by-combat" myth are "not gainsayable." The ancient Mesopotamians believed that the world was a flat circular disc surrounded by a saltwater sea. The habitable earth was a single giant continent inside this sea, and floated on a second sea, the freshwater apsu, which supplied the water in springs, wells and rivers and was connected with the saltwater sea. The sky was a solid disk above the earth, curved to touch the earth at its rim, with the heavens of the gods above. So far as can be deduced from clues in the bible, the ancient Hebrew geography was identical with that of the Babylonians: a flat circular earth floating above a freshwater sea, surrounded by a saltwater sea, with a solid sky-dome (raqia, the "firmament") above. It is the creation of this world which Enuma Elish and Genesis 1 describe. 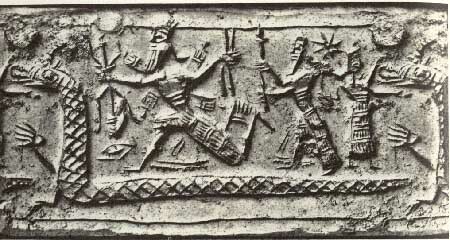 In both Enuma Elish and Genesis, creation is an act of divine speech - the Enuma Elish describes pre-creation as a time "when above, the heavens had not been named, and below the earth had not been called by name", while in Genesis each act of divine creation is introduced with the formula: "And God said, let there be...". The sequence of creation is identical: light, firmament, dry land, luminaries, and man. In both Enuma Elish and Genesis the primordial world is formless and empty (the tohu wa bohu of Genesis 1:2), the only existing thing the watery abyss which exists prior to creation (Tiamat in the Enuma Elish, tehom, the "deep", a linguistic cognate of tiamat, in Genesis 1:2). In both, the firmament, conceived as a solid inverted bowl, is created in the midst of the primeval waters to separate the heavens from the earth (Genesis 1:6� Enuma Elish 4:137�). Day and night precede the creation of the luminous bodies (Gen. 1:5, 8, 13, and 14ff. ; Enuma Elish 1:38), whose function is to yield light and regulate time (Gen. 1:14; Enuma Elish 5:12�). In Enuma Elish, the gods consult before creating man (Enuma Elish 6:4), while Genesis has: "Let us make man in our own image..." (Genesis 1:26) � and in both, the creation of man is followed by divine rest. "Thus, it appears that the so-called Priestly Source account echoes this earlier Mesopotamian story of creation." and thy command shall be fulfilled. and her mouth she opened wide. Then Anu raised the ... in the assembly of the gods. He kissed the bow, saving, " It is...!" The sinner and evil-doer in his presence. Bel in heaven hath formed. In water nine cubits deep he draggeth ..."
All the gods of heaven. And opened his mouth and spake unto the god. "Stir up cloud, and storm and tempest! For three years and three months, one day and one night. The blood of the dragon flowed. These story is metaphoric in content. Dragon symbology represents DNA or the human biogenetic experiment set in motion in Sumerian Creation Mythology.